Unparalleled amenity characterises the Signature experience, offering residents an elevated lifestyle of ease, refinement and pleasure. The crowning glory in the Signature experience, a 50-metre infinity edge pool spans the entire width of the podium, epitomising everything this lifestyle has to offer. The infinity edge continually draws the eye to the horizon, highlighting the intimate connection to the ocean from this extraordinary position. Located by the beautiful pool area, an exclusive indoor retreat of luxury and calm. Comfortably appointed and with a soothing ambience, a space to meet, read or relax. 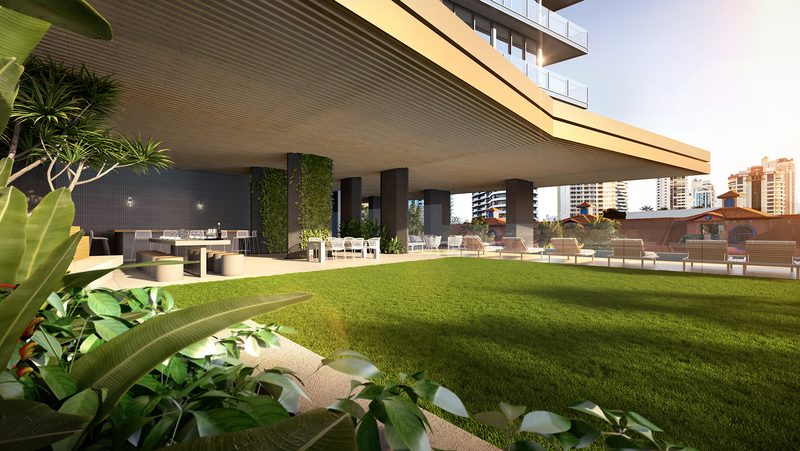 Expansive outdoor lawn provides a lush, family-friendly space for entertaining on the stunning podium. Features barbecue facilities, teppanyaki grill and outdoor lounges. Your space for entertaining. Featuring a kitchen with Miele appliances and overlooking Signature's stunning pool, this beautiful area sets the scene for a perfect evening with neighbours or friends.